← More Sea Lion Action and an Eagle Too. 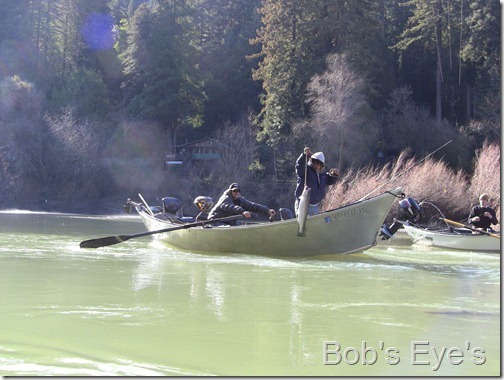 Steelhead Fishing On the Russian River, CA. 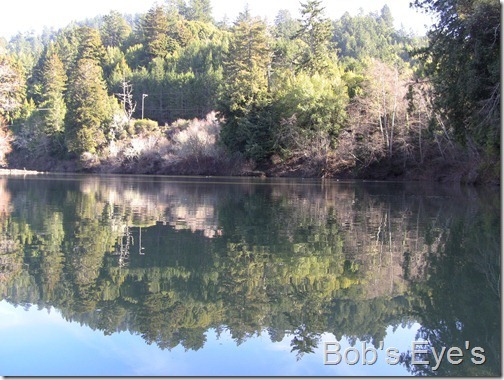 Saturday, Jan. 19, 2013, Monte Rio, CA. Kayaking Monte Rio to Casini’s and back. Added Note: November 4, 2013: I note a lot of people come here for salmon fishing on the Russian River. 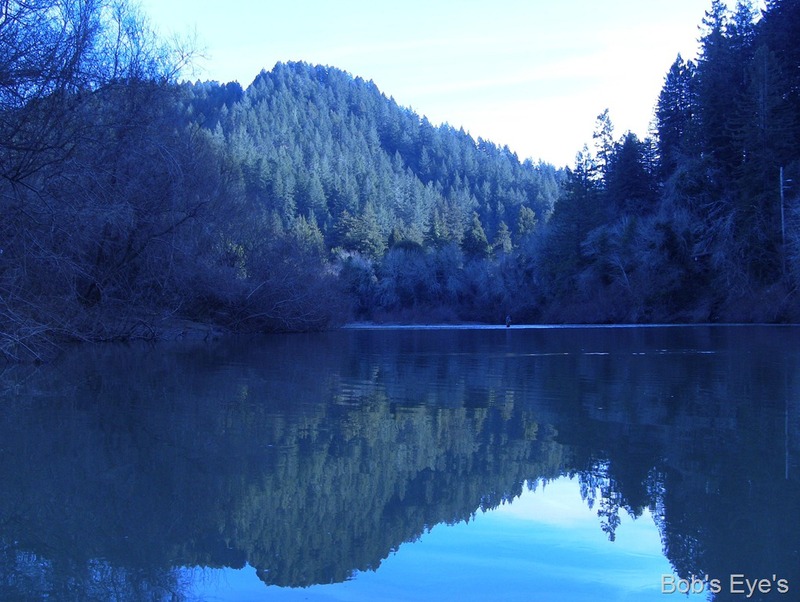 At this time, there is no salmon fishing on the Russian River, none. You can’t even fish for them. Period, closed. 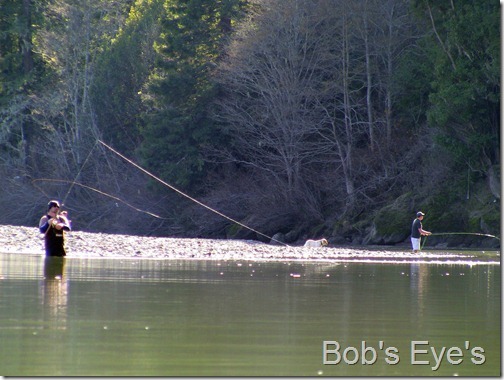 The season would normally be early September to December, then steelhead season starts, which you can fish for. The season is December through April. Since it’s steelhead fishing season on the Russian River, I decided to kayak from Monte Rio to Casini’s today and back again to see what the fishermen were doing. 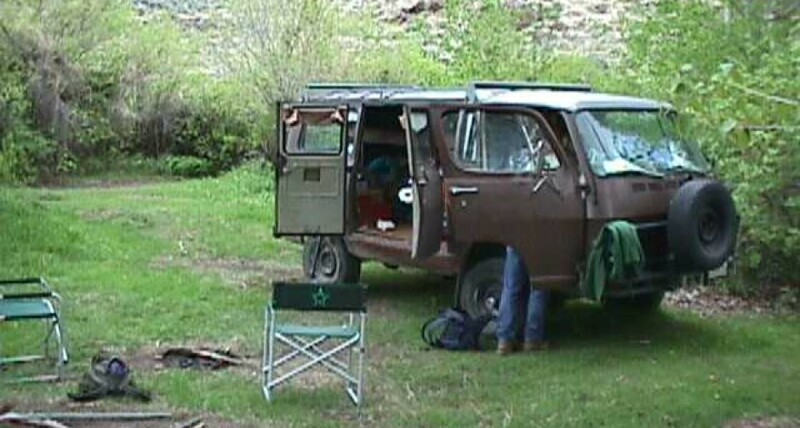 Put in time was about eleven thirty at the Monte Rio boat ramp and I headed down the river. It was a fine sunny day. Lots of fishermen on the Russian River today. Lots of fishermen on the river, both in boats and fishing from the shoreline. 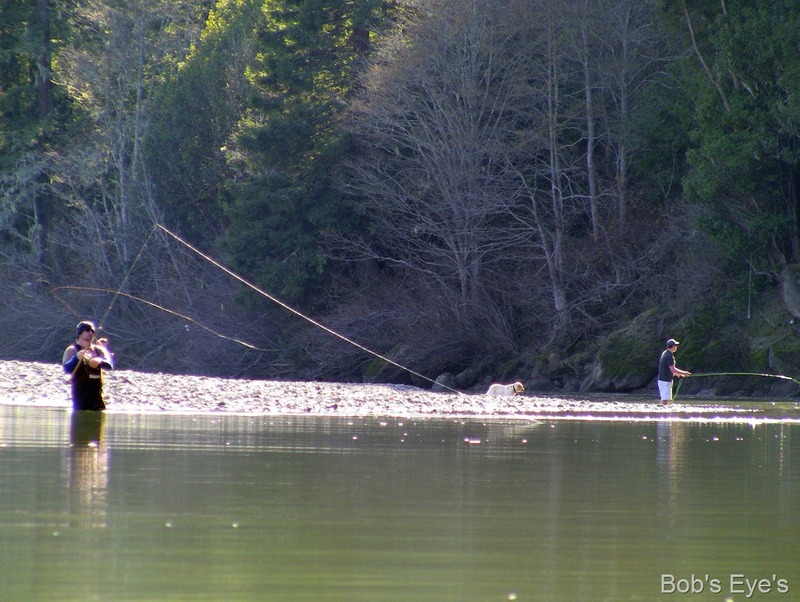 The river water is clearing up, so the fishing is on. There were some boats fishing in the slot, just below Monte Rio, and below is what that looked like. Fishermen shoot the bull a lot. I knew some of the guys in the boats, so I stopped and shot the bull with them for a bit, exchanging fishing info. As I was talking to the guy, all of a sudden, fish on, that’s what they say when one of them has just hooked a fish and the other guys should get their gear out of the water and out of the way, so they all don’t get tangled up when the fish starts to run. A steelhead fish was caught. These guys just caught that fish, they said about an eight pound steelhead, as you can see below. I continued down the river toward Villa Grande hole, the first turn in the river, below Monte Rio. 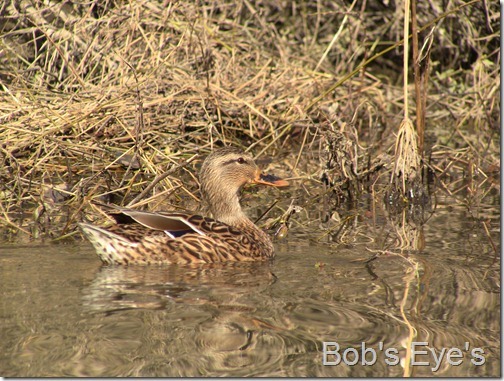 A nice picture of a female Mallard duck I captured on the way down there, see below. It was as nice paddle, with the sun out and all. As I approached the Villa Grande hole, I saw Andrew standing on the shore there walking his big dog. I talked to him awhile about fishing then continued on down toward the Casini Ranch, taking my time and taking it easy on the way. Lots of fishermen down at the Casini Ranch. There were a lot of fishermen at Casini’s, maybe about fifteen or twenty, all told. None of them were fishing from boats, they fished, either from the shore or from wading into the water and fishing. Most of them were fly fishing. I heard a guy say one little fish was caught, just as I passed, but not too much fish catching action down there. I spent about a half hour at the Casini Ripple watching for fish, but didn’t see any.I paddled past Casini’s a bit, just to check it out. Mostly fly fishing at Casini’s. 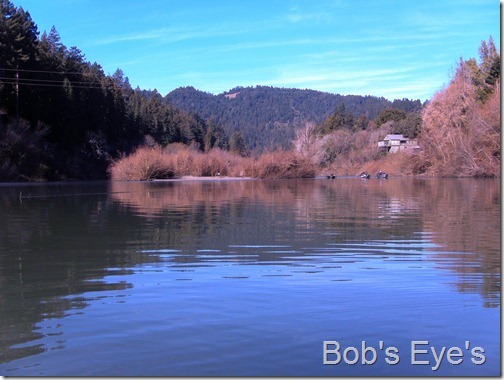 In the picture below can be seen a couple of the fly fishermen, just below the Casini Ripple, at Brown’s hole. I was down at Casini’s about an hour total and I started heading back up the river, again, taking my time and enjoying the trip. Moscow hole is always a real beautiful area. 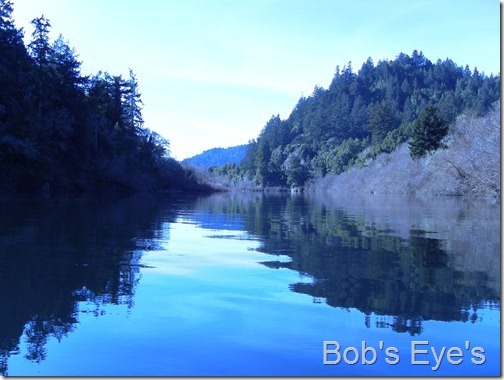 Below, is a picture of the river just above Moscow hole, or just above Rein’s beach, looking up the river. Below is another picture of the river, about a half mile above the Moscow hole, looking back down the river. What’s that over in the bushes? I heard something over under the bushes and when I checked it out, there was this little wood duck, hiding under the bushes, as you can see below. Some excited young ladies at the Villa Grande Hole. 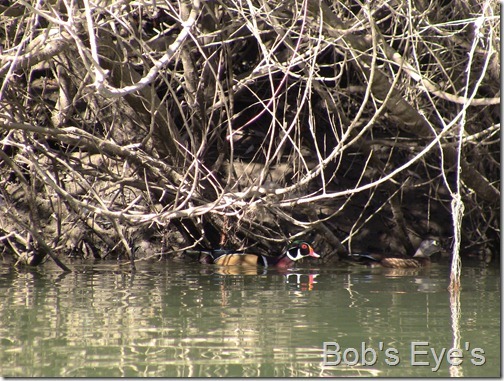 When I got back to the Villa Grande hole, I was sitting in the rivers bend and there were a about six young ladies on the beach across the river from me. I heard one say, hey, there’s a big fish over here to some other people on the beach. 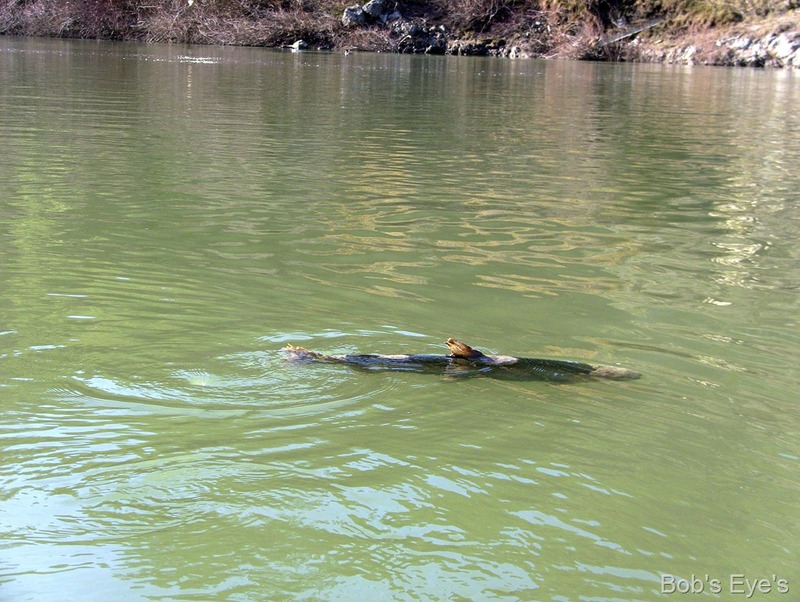 I heard,………….. it’s a big fish of some kind, a salmon or a Sturgeon,…………… really, or maybe it’s a log? Now, a sturgeon is a really big fish and they have been seen on very rare occasions at this hole, the Villa Grande Hole, but it wasn’t likely. I had to go check it out, of course. I paddled over there about fifty feet below the young ladies and sure enough, there was a big fish there all right, but not as big as they indicated. A big ol spent steelhead is what it was. Turned out to be a steelhead, I think. 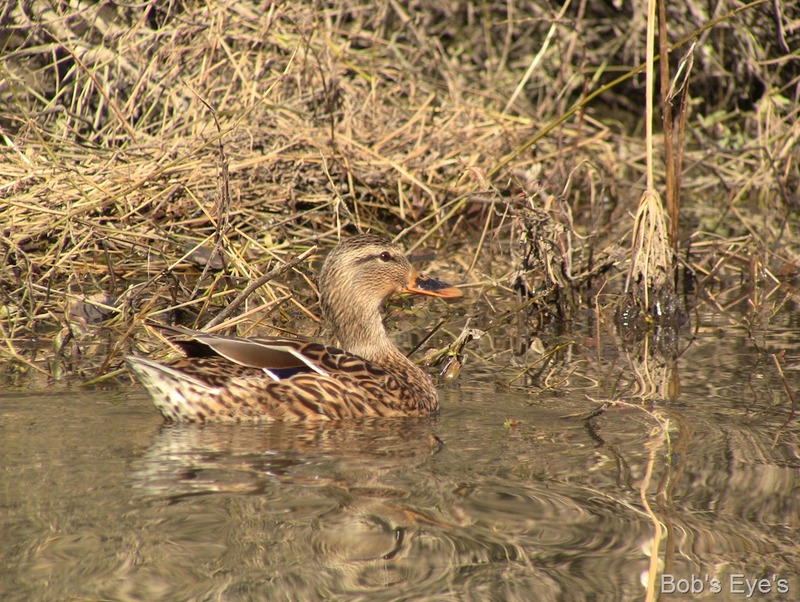 It likely had done it’s egg laying thing up river and after they do that, they return to the ocean, worn out. About half of it’s skin was gone and most of it’s tail, and it moved fairly slow. Likely a seal will get it soon. 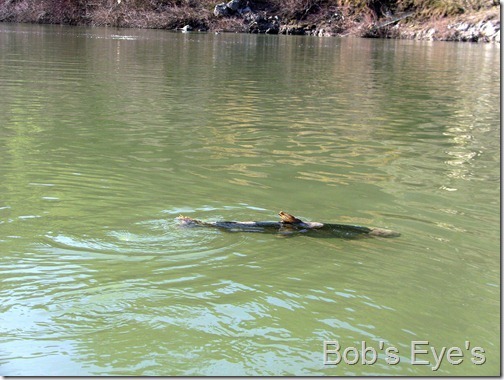 Below, is the spent steelhead I saw at the Villa Grande Hole on the way back up the river. It’s a couple feet long. It’s pretty chewed up as can be seen by the tail or the lack of most of it. 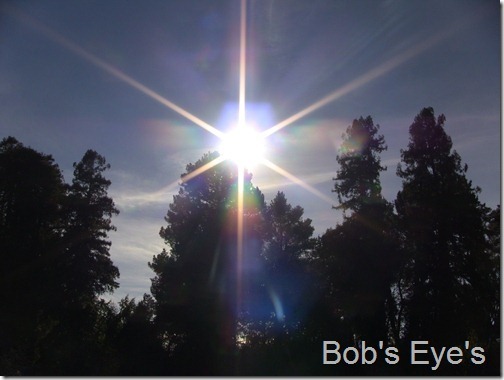 The sun sinks below the trees early this time of year. The sun was sinking in the sky, just starting to go below the big redwood trees, as it does this time of the year, early in the day, as you can see below, from the Villa Grande Hole. The sun was sinking and I was getting hungry, so I headed on up to Monte Rio to take my boat out. Of course, I talked with the fishermen some more in the boats, they had a fairly good day and then headed on in to the Monte Rio boat ramp. The picture below was taken looking up river toward Monte Rio, which is just at the foot of that mountain in the background. Another nice day on the river. This entry was posted in Uncategorized and tagged Cassini's ca., fishing, kayaking, Monte Rio CA., Russian River, salmon, steelhead. Bookmark the permalink.